Suicide accounts for an estimated 1.4% of all deaths worldwide. In the UK, approximately 6,000 people die by suicide per year, although suicide rates are falling. Many people who die by suicide are patients with mental illness and over a quarter are in touch with specialist services. In 2015, there were 1,538 deaths by suicide in individuals who had been in contact with mental health services in the previous 12 months. Many had factors associated with high risk of suicide (e.g. self- harm, substance misuse, economic problems) but the majority (88%) were judged to be at low or no immediate risk of suicide by clinicians at their final service contact. 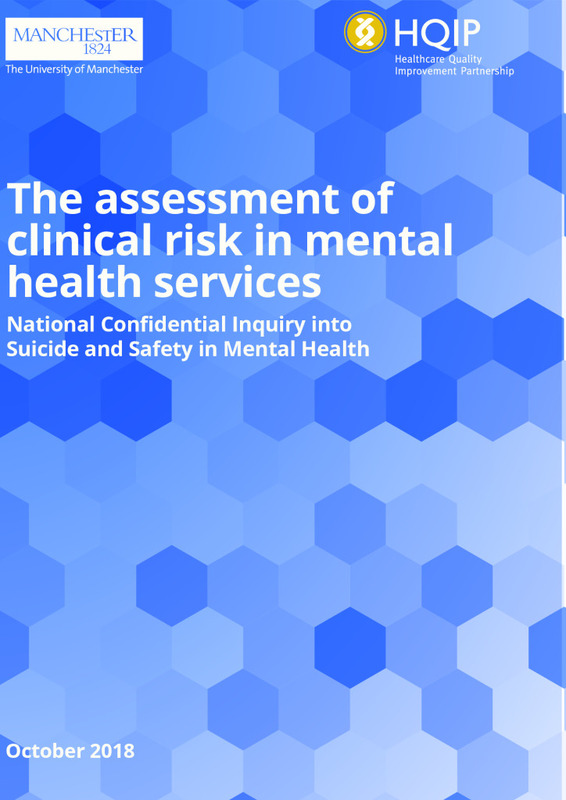 The assessment of clinical risk in mental healthcare is challenging but provides an opportunity to engage with patients, and their carers and families in order to promote the patients’ safety, recovery and wellbeing. A good risk assessment will combine consideration of psychological (e.g. current mental health) and social factors (e.g. relationship problems, employment status) as part of a comprehensive review of the patient5 to capture their care needs and assess their risk of harm to themselves or other people. The Department of Health’s Best Practice in Managing Risk defines risk as relating to the likelihood, imminence and severity of a negative event occurring (i.e. violence, self- harm, self-neglect). In mental health services risk assessment has traditionally focused on prediction. Patients may be categorised in to low, medium or high risk of a particular outcome. Checklists of characteristics or risk scales are sometimes used to estimate the likelihood of harm occurring. However, research suggests that categorising risk in such a way is unhelpful in guiding the treatment and management of a patient9, and has poor predictive value. Our previous research has shown that despite common risk factors, risk is often individual and suggests risk management should be personalised. To download the full report click on the green button below.